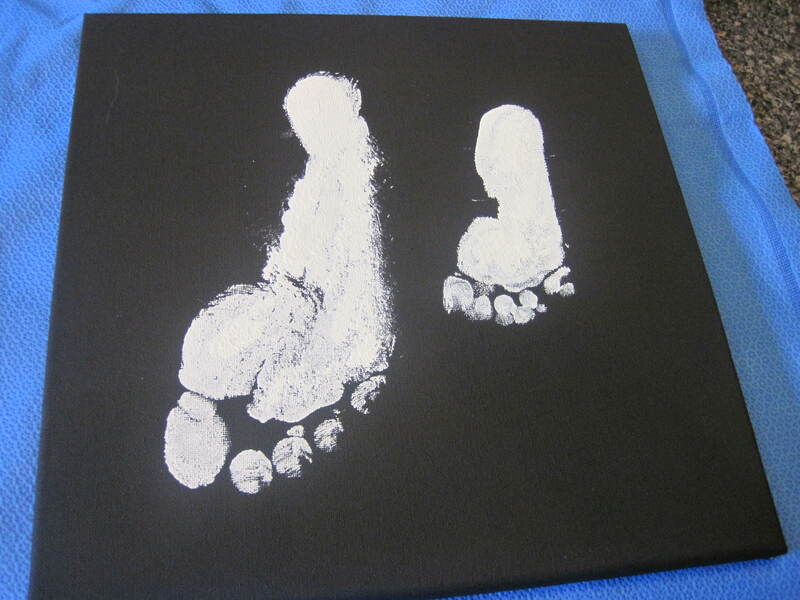 Hand and footprint art… usually geared towards kids’ hands and footprints, but hey, to each their own! My kids love to art. Christopher takes an art class, and studies art history as part of his lessons, and few things cause shrieks of joy from His Majesty quite like the sight of crayons or paint. They are little artists, and I love their creations. A few years ago, when I’d accumulated so much of Christopher’s art work that it was spilling out of two Rubbermaid bins, I decided that I had to do something different in terms of storage, so I started photographing his artwork and printing it out in bound photo albums, just like in this pin. That allowed me to keep the image of every adorable stick figure crayon drawing without having to store the giant piece of paper it was crafted on. It changed the game entirely, and I highly recommend it. 90% of the boys’ artwork now gets photographed and filed to go into an album, and the other 10% is handprint art. There are few things that I like to do more than go back and compare their little hands to prints from when they were younger, and to compare Christopher’s handprints from when he was the same age as His Majesty. It’s so nostalgic and sweet to see how they’ve grown. 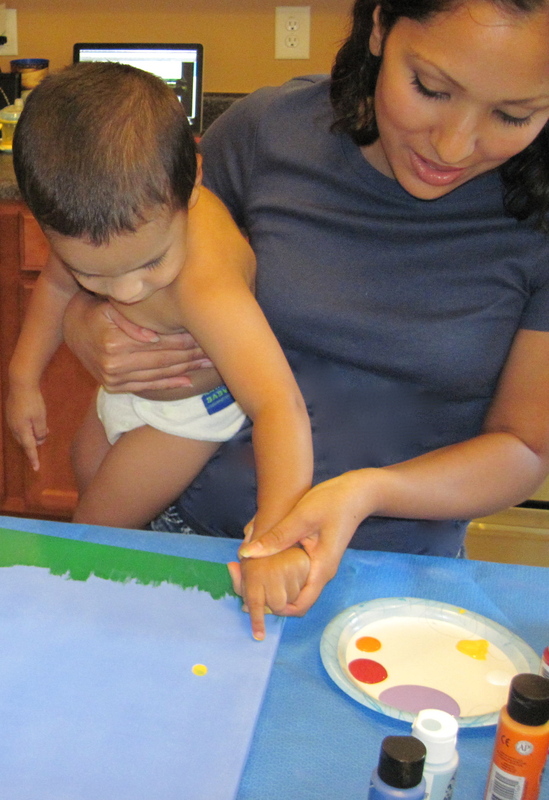 Since there’s so many great ideas for handprint art out there on the web, I decided to help them create a masterpiece for their grandmothers this year for Mother’s Day. I gathered some pinspiration from this pin from The Crafty Crow, which has all sorts of creative children’s craft ideas, and from this tutorial from Share and Remember, which shows you how to make the most adorable handprint calendar. I’ve already got my wheels spinning to make it in the future. Our project didn’t take very long to complete, and, as an added bonus, it fit into a large mailer envelope from Wal-Mart, which made it easy to ship. We started off with 11×14 canvases, a foam roller brush, foam brushes, small (very inexpensive) paintbrushes, and acrylic paint. I had all of this lying around my house from previous projects and purchases, so the only thing I actually had to purchase were the envelopes and the cost of postage. If you had to purchase everything, it would be under $10. 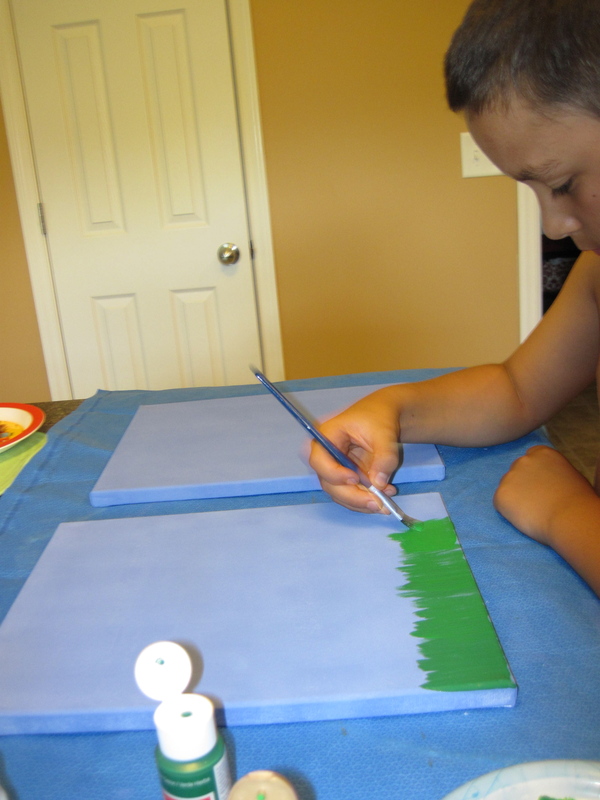 Christopher mixed some blue paint and used a foam roller to cover each canvas. We did this just before bed one night, and it took less than 10 minutes to do both canvas. 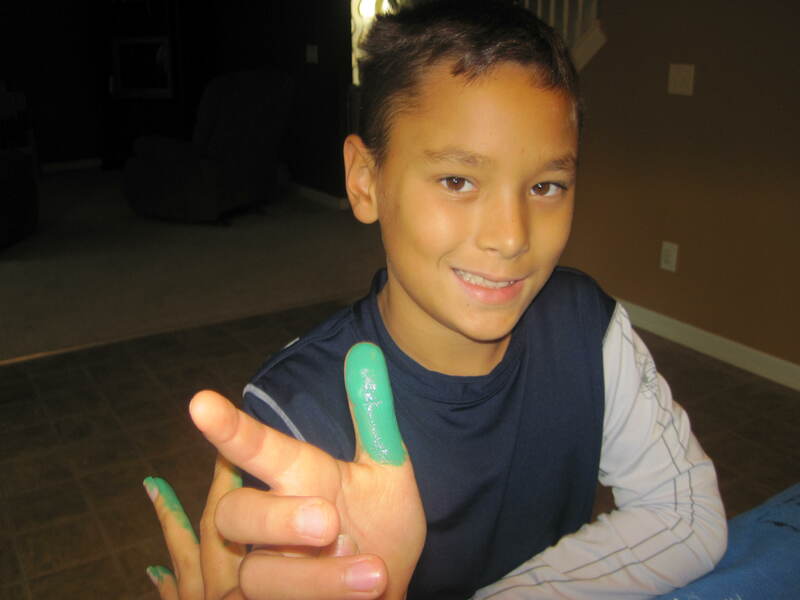 The next day, he mixed some green paint to make grass along the bottom. Then, we helped his Majesty work his magic, crafting some of the “flowers”. 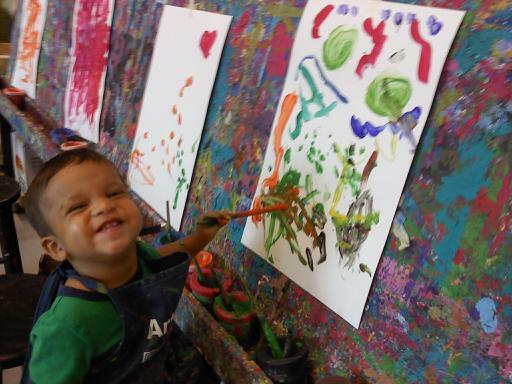 He’s a pro at fingerprint and handprint art, on account of he goes to play school one day a week and they do lots of art. Right now there’s a wrapped gift for me taunting me on the counter that I’m confident is some sort of handprint awesomeness made with the help of his play school teachers. I want to open it badly, but I’m patiently holding out until Sunday. 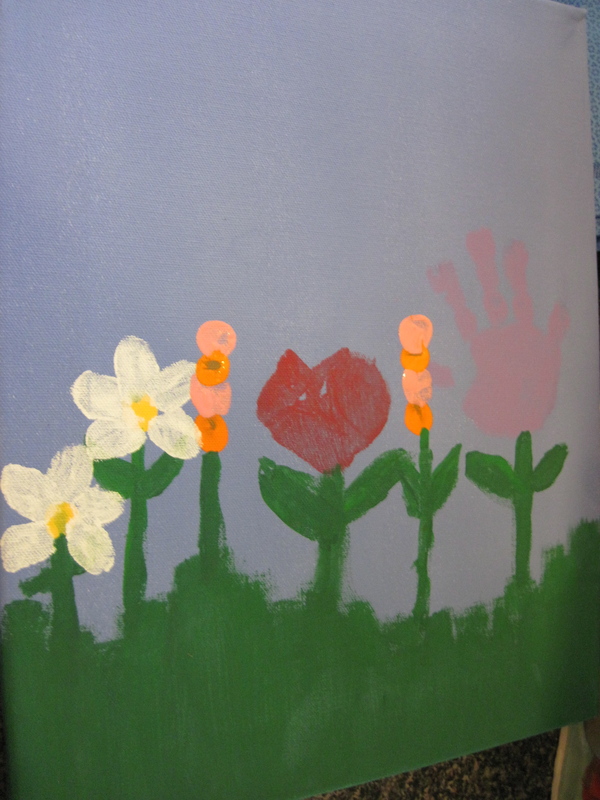 Anyway, I helped him use his thumbprints to make the yellow centers of the “daisies” and part of the orange and pink “gladiolas”, his palm print to make a red “rose”, and a purple handprint “tulip”. I use a foam roller to apply the paint nice and thick on his little hands, and I had to work fast, because the paint starts to dry quickly. Then I applied a little bit of pressure to his hand and fingers on the canvas to get a nice even print. They added stems and leaves next. But do you see that really fat stem on the “rose”? That was the stem that led to Christopher vetoing any further attempts by His Majesty to paint on the canvas. We distracted the little guy play with a foam brush and a scrap piece of paper instead, and everyone was happy. After about 20 minutes of drying time, Christopher used the top joint of his index finger to fashion leaves for the “daisies”, and then used his middle fingertip to polish off the pink and orange “gladiolas”. 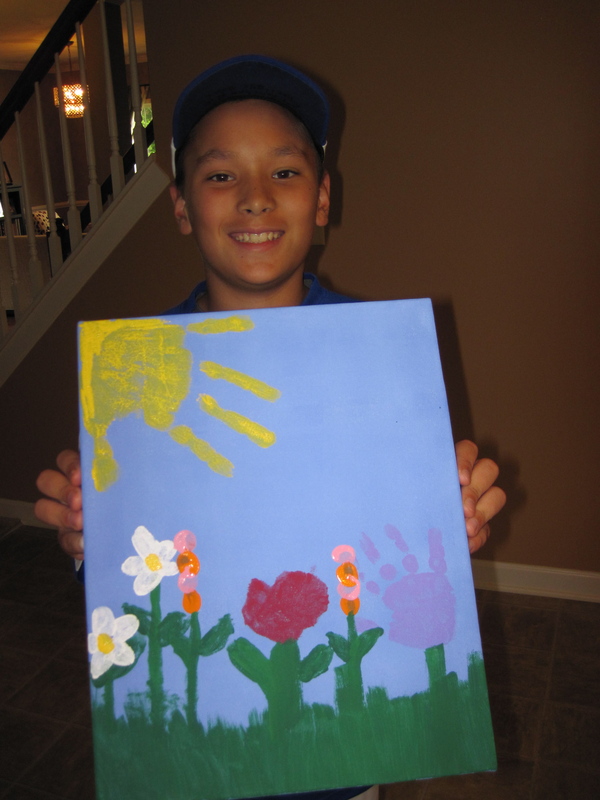 Then, he put the finishing touch on the pieces, placing a bright yellow handprint in the corner as the “sun”. There was a gap at his wrist area, so he filled it in with yellow paint and the foam brush. See how proud he looks? He really had fun doing it. He also wrote cards for them, and in the cards, he told them all about which part of the painting he and His Majesty had done. A simple, easy, from the heart–and from the hands– gift for their grandmothers. I hope all of you mothers– and all of your mothers and grandmothers– have a wonderful Mother’s Day weekend! I love spring, partially because it’s warm enough to be outside, but not so hot by noon that it makes me want to hibernate with the shades drawn and the AC set to South Pole, but mostly because of the flowers and the garden and the yard work. A lot of yard work. It don’t mind though, because it’s generally work that I get to be immediately rewarded for. I can see the results of my efforts right away when I rake out leaves and set more mulch and prepare the ground for another round of annuals (our frost date is April 15, and I can hardly wait!). Then there’s the garden boxes that will need planting, and some potted herbs and lettuce given to me by my awesome friend Emily. I really enjoy this time of year. I really just enjoy getting to play in the dirt. There’s something kid-like and soothing about patting down soil and handling mulch and mud. I don’t wear gloves unless I am messing with something “picky”, so I tend to get good and dirty. And so do my fingernails. Enter this recipe for lemon sugar hand scrub, which was inspired by Stephanie Lynn at Under the Table and Dreaming. I made some of Stephanie Lynn’s version for a Christmas Bazaar a few months ago, and gave some away as gifts, and it was so easy. I figured that I might as well whip some up to keep around my kitchen. 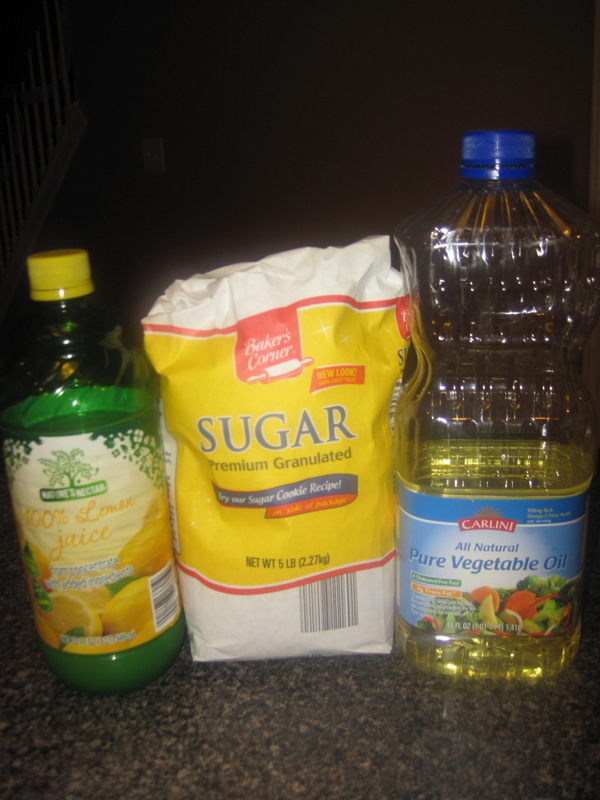 Three ingredients: Lemon juice, sugar, and vegetable oil. Stephanie used olive oil, and you can also use sunflower, grape seed or safflower oil if you prefer. This is a pretty flexible formula. 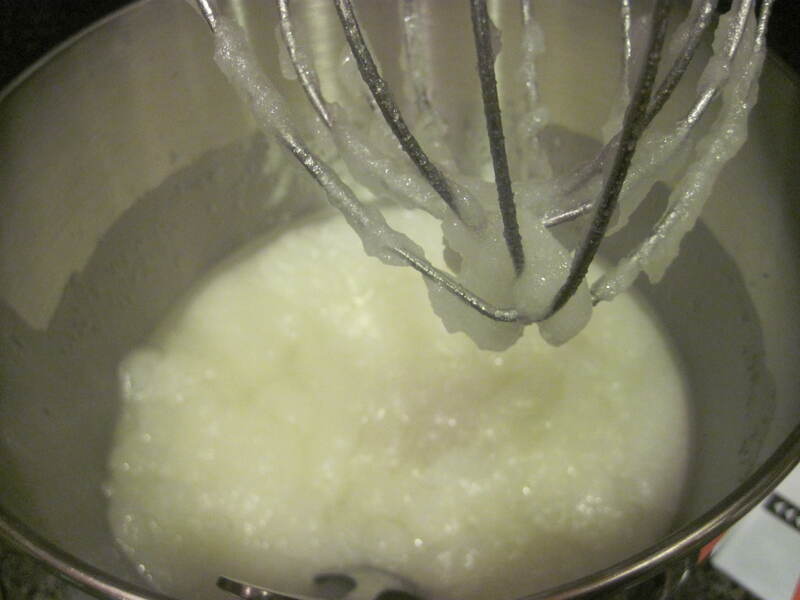 I’ve learned that the ratio of sugar to oil when you’re making a scrub is 2:1, so 2 cups sugar to 1 cup oil. Then add a few tablespoons of lemon juice (I used 4, like Stephanie Lynn suggested) and blend it all together. You can also use a few drops of lemon essential oil instead of the lemon juice. I used my stand mixer, because it’s this is all obviously edible stuff, but you can also use a big bowl. If you mix it by hand, literally, mix it BY HAND. It will be easier than using a spoon and you’ll get everything blended better. Plus, you’ll exfoliate your hands while you mix it. Once you get it mixed to a uniform consistency, spoon it into a wide mouthed container. You want to container to be large enough at the opening so that you can fit your hand inside. 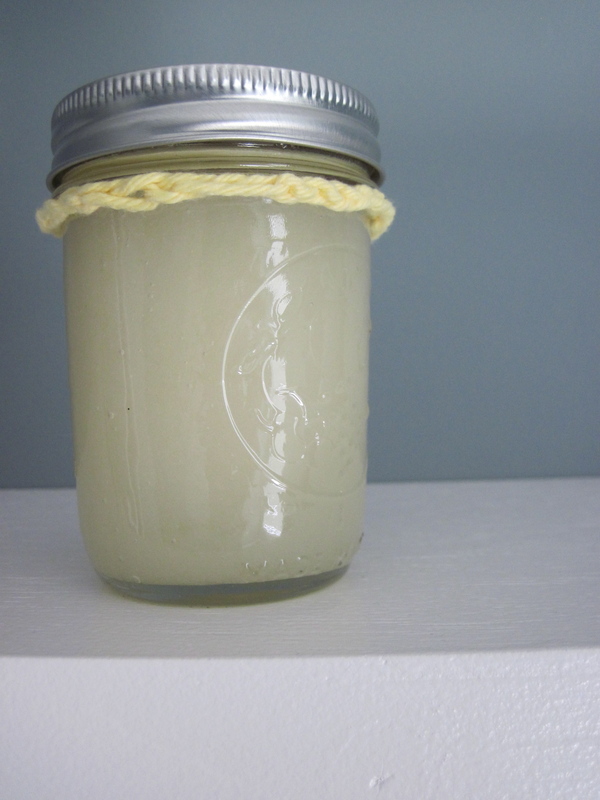 This recipe makes a little more than 1 cup of Lemon Sugar Scrub. I stuffed mine in an 8 ounce mason jar, and used the rest on my hands right after I finished making it. Perfect to have around the house for yourself, or to give as a gift to a friend! Do you make any of your own beauty supplies? Care to share any ideas? Holy Smokes, I did a Guest Post! I’ve been on a fantastic two week vacation with my family (including my adorable 80 year old Grandma, who seems to defy age in every possible way), but I couldn’t resist popping by to say hello, and to let you know that I was asked to do a guest post for Triad Moms on Main! It’s about a Reindeer hand print Christmas ornament that I made with His Majesty, as part of a family ornament tradition that we started a few years ago (Pssst! It would make a really great addition to your tree, or a great keepsake gift for Grandparents and Godparents). Pop on over there and check it out! Hope your December has been fantastic, low stress, and full of fun family traditions. Looking forward to showing you some of the fun stuff that I’ve been up to when I get home in a few days!! In the meantime, add Triad Moms on Main to your blog roll– they always have something interesting to say! There is so much Halloween cuteness to be found on Pinterest that I had to make a separate board to keep my inspirations straight. Pumpkin carvings like this and snacks like this. Don’t they just make you want to host a Halloween party?! 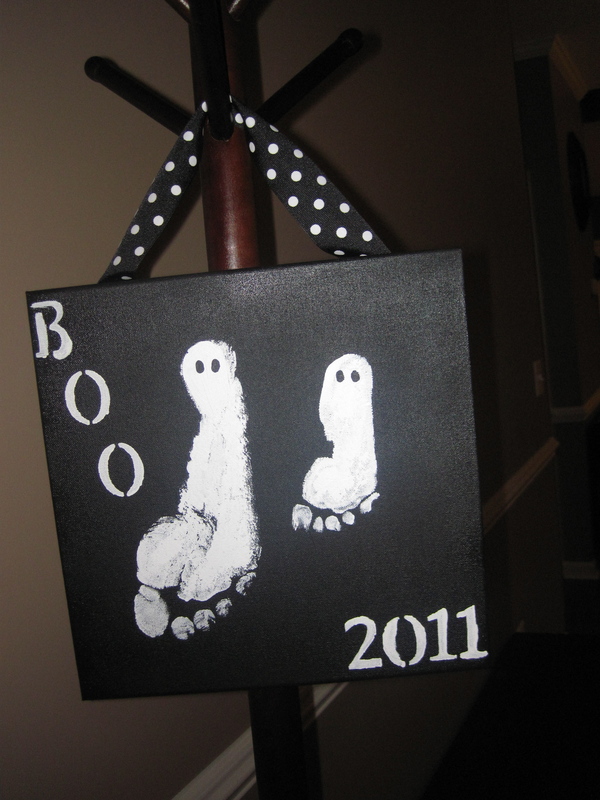 Plus, after I made the ghost feet canvas, and loved it, I didn’t want to waste any time getting on board making this adorable kid friendly craft . I wanted to get it up on the wall as soon as possible, so that I didn’t have to wait until next year to display it. Here was my inspiration. 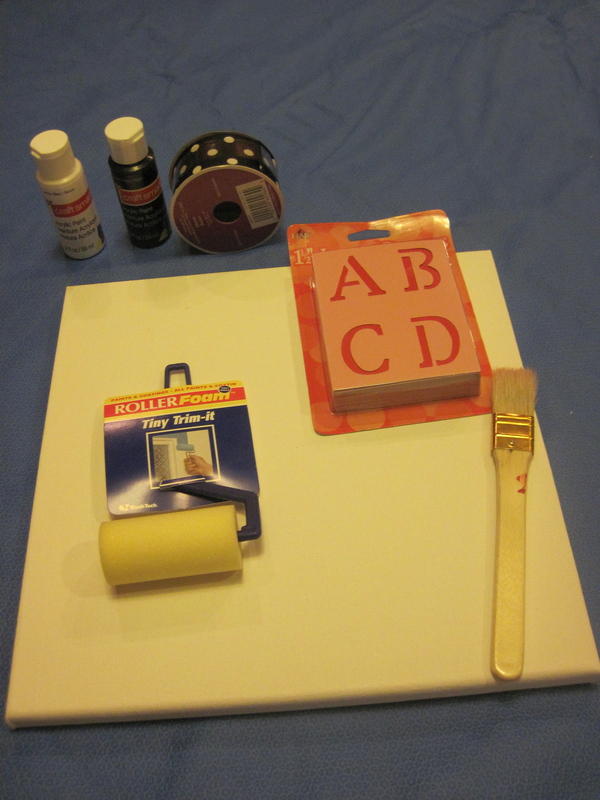 I’d already purchased the canvas in a bulk pack using a 40% off coupon at Hobby Lobby(making each 12×12 canvas cost about $1.20), and I already had brushes, spray acrylic sealer, white paint, and stencils from previous projects. So, I stopped at Michael’s and grabbed four tubes of acrylic paint (two different oranges and two different greens) and a roll of orange ribbon with white trim to use to hang the canvas. By the way, educators, including home educators, get an additional 15% off every day at Michael’s, so bring your teacher ID or homeschool registration card if you want to save some extra money. My out of pocket for this rang in just shy of $5. Anyway, I brush painted the canvas white at night, after my boys had gone to bed. 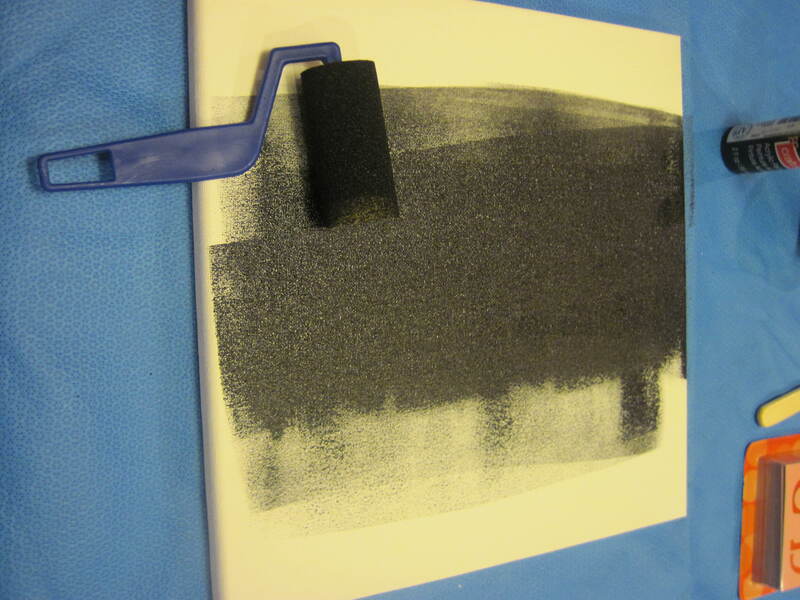 I should have used a foam roller, like I did on the ghost footprint canvas, because it was quick and seemed to give really even coverage, but my roller wasn’t completely dry when I started this project, so I had to make due with brushes. 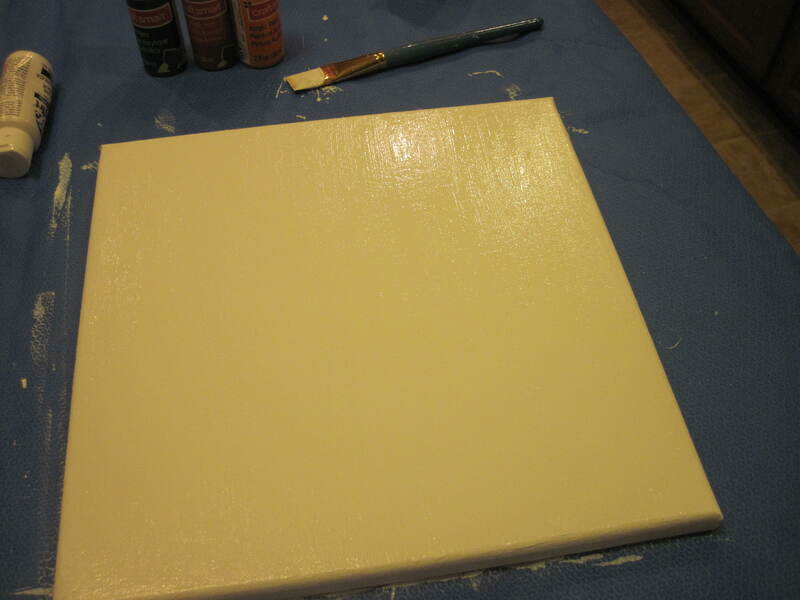 White paint on a white canvas... not much to see yet! 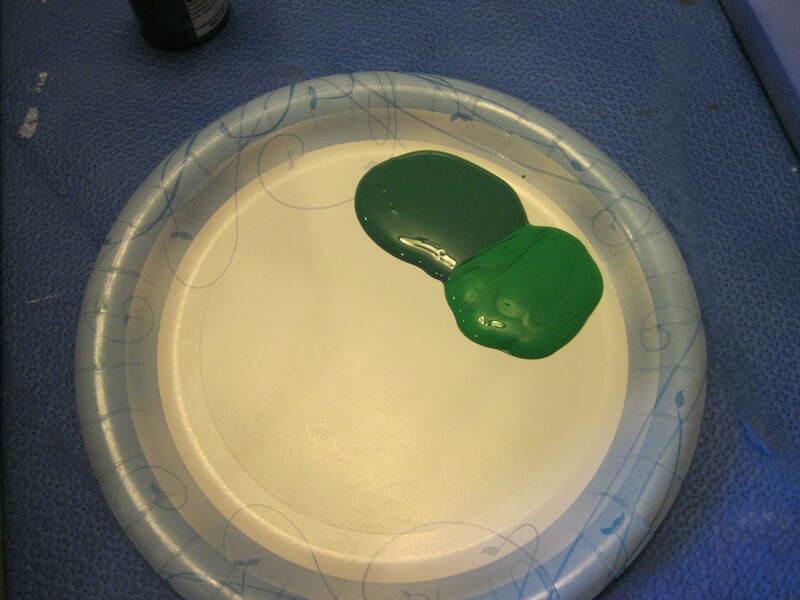 I did two coats of paint, letting it dry for about 30 minutes in between coats. 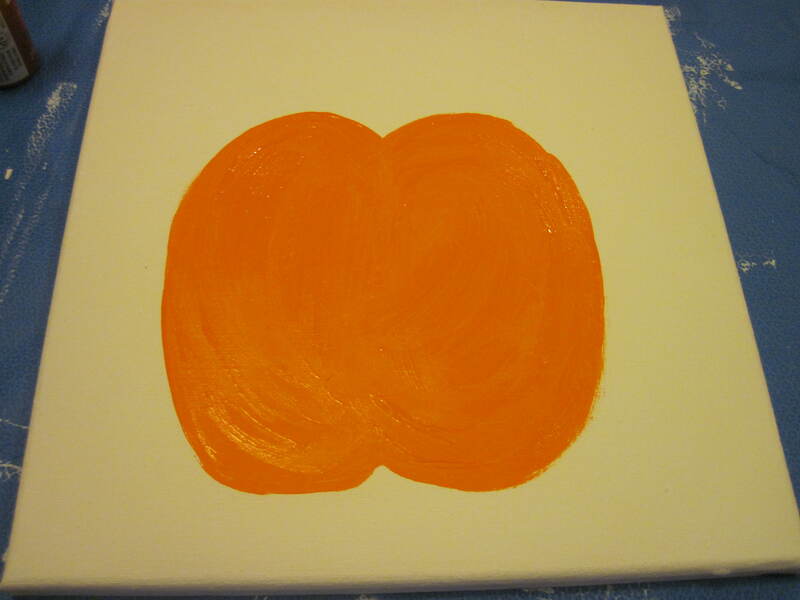 Then I painted a big orange pumpkin. I just free handed it, starting small and then making it larger until I liked how it looked. Then I did some stripes in a slightly darker shade of orange to try to show some depth, stenciled in the year, and let the whole thing dry overnight. 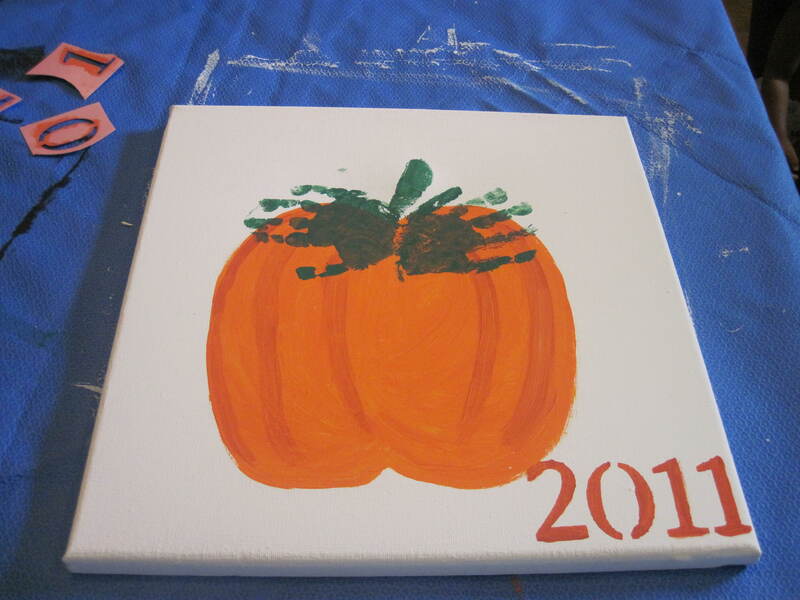 This is the first handprint art I tried with the boys since the disaster that was Father’s Day 2010, when His Majesty, then a mere 3 months old, screeched like a banshee and refused to humor me by opening up his hands. Talk about a big fat, FAIL! But this time, this time was going to be different. This time, the project was going to go perfectly. After all, our footprint effort had gone off without a hitch, so naturally, I was more than hopeful that this project would be a success. Well, it wasn’t exactly as easy as I’d hoped. My plan was to use Christopher’s hands to do the leaves first, and then use His Majesty’s hands to do more leaves in a slightly lighter color green, kind of overlapping them. Seemed pretty straightforward, right? Yes, except that Christopher is eleven years old, and his hands are officially almost as large as my own. 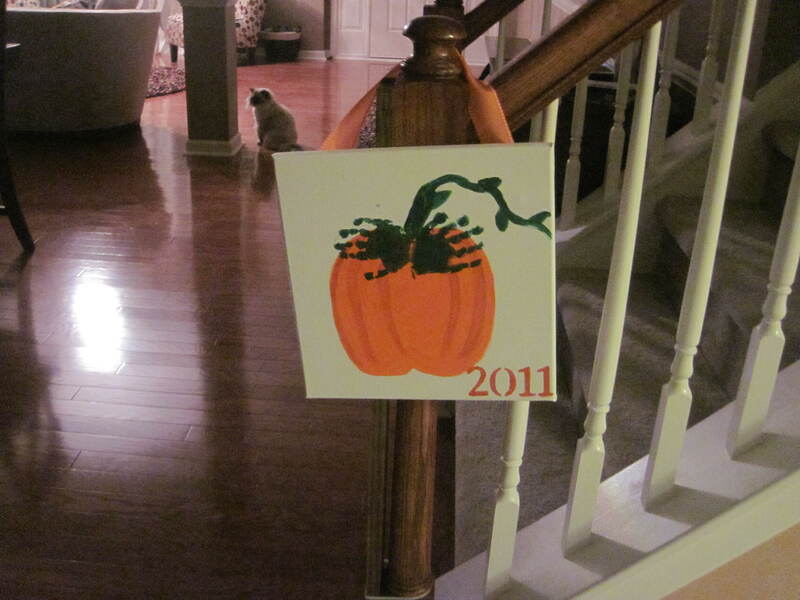 Which would have been fine, except that the pumpkin I painted was not large enough to make that work. 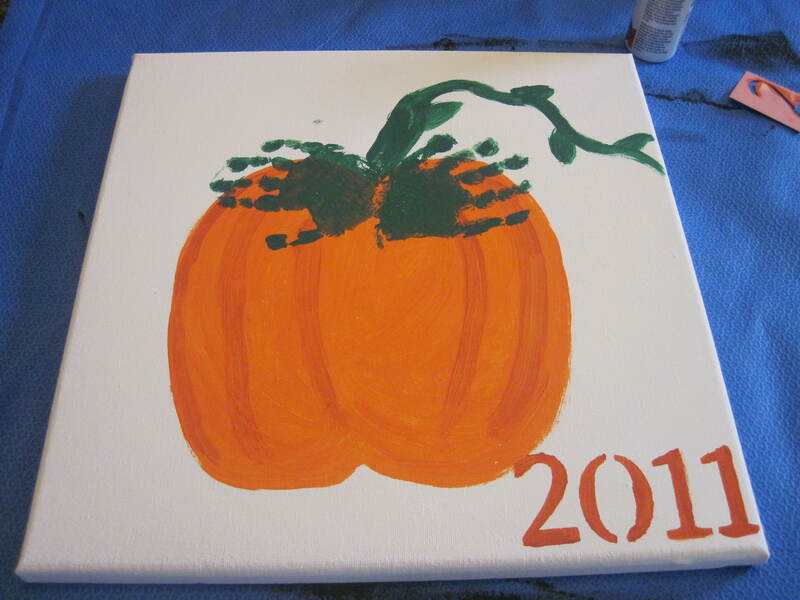 And because I’d already stenciled in the year, I would have had to paint over the stencil in a few coats of white paint, wait for it to dry, enlarge the pumpkin, wait for THAT to dry, and then do the handprint leaves. I was so bummed. But then Christopher, the independent thinker that he is, suggested that we use his thumb as the stem of the pumpkin, and leave little brother’s hands to serve as the leaves. YES, I agreed, that sounded perfect! We started about the task of gathering His Majesty, who was clearly disturbed that he was not being granted the privilege of holding the paintbrush. Luckily, he didn’t make too much of a fuss about it. It was early, and mercifully, I don’t think he was fully awake. Not exactly thrilled with his role in this project. So, all was going well with the painting of his palm, except that when I got ready to make the first print, he closed his fist. Tightly. 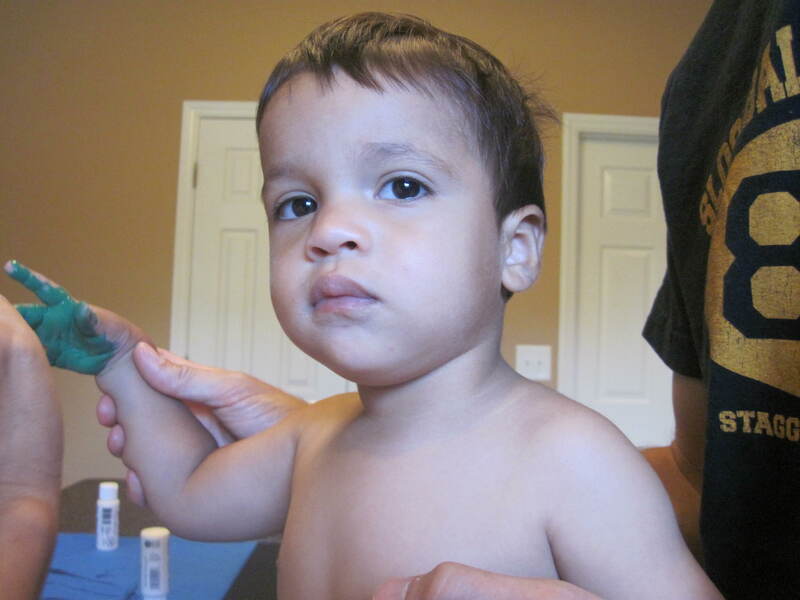 And by the time I’d convinced him (aka, bribed him with the promise of a banana) to open it, the paint was kind of dried. So I had to repaint his hand, and then quickly press it to the canvas. Anyway, we eventually got it, and the other hand, too. And they looked pretty darn cute, despite some areas that would need some minor touch ups. Then came time for Christopher to do the stem. 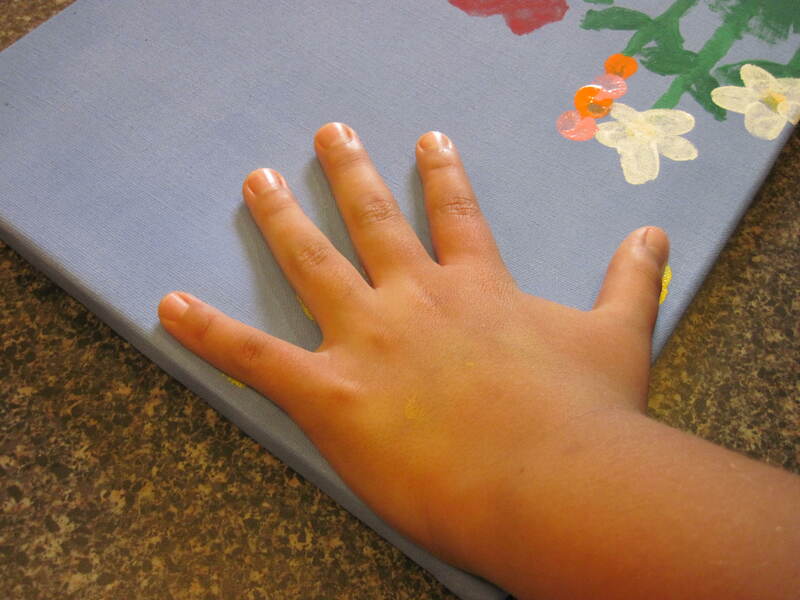 He expertly painted his thumb and made his mark on the canvas. His print was even, and dark, a real 10+ thumbprint…but… do you see what we saw? Eh. It worked out ok. See the cute little handprints? And those nice stenciled letters? Focus on those… Because I obviously need some practice making vines. 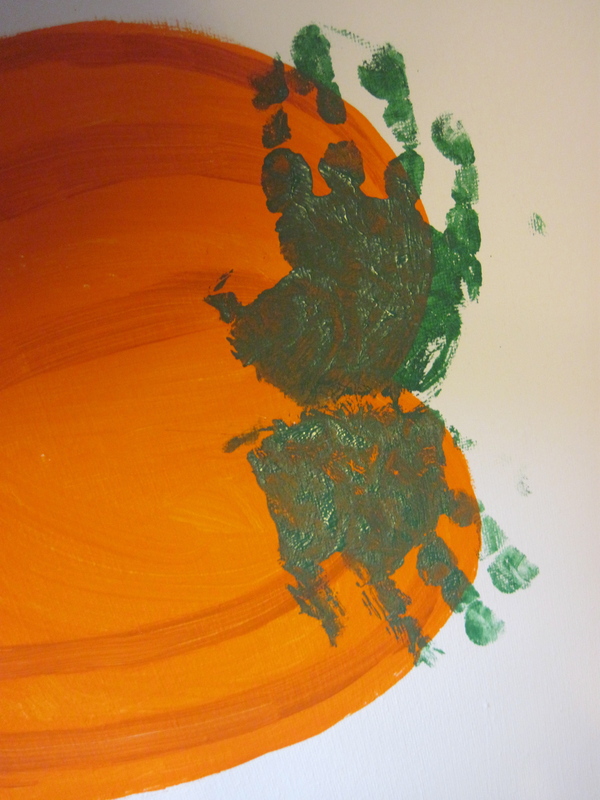 And I probably should have googled images of pumpkin leaves before trying to paint them, considering that mine don’t look the least bit like them… but, we got it done (in under an hour), despite a few minor changes to the original plan. Plus, we had some laughs about it, which I’m sure we’ll remember every year when I dig this beauty out of the Halloween box. After it dried, I took it outside and sprayed it with acrylic coating, to seal the paint so that I can keep our creation for years to come. The acrylic has to dry for 24 hours before you handle it, so it was another 2 days before I was ready to put the finishing touches on it and hang it up. I asked my husband to help me staple the ribbon to the back of the canvas, and I should have just waited for him. However, I’m a little bit impatient, and in the 20 seconds of waiting on him, I decided to just staple it myself. How hard could it be to use a staple gun, right? Wrong. What happened next was so disappointing, not to mention a bit scary, plus it made me mad, but didn’t kill or impale me or anyone in my family, so all is well. I picked up the staple gun, squeezed the trigger, heard a loud crack, and then looked down to examine my handy work. But there was no staple holding the ribbon to the canvas. And just as I opened my mouth to ask my husband what kind of cruddy staple gun we owned, he turned the corner into the kitchen, and I realized what I had done. 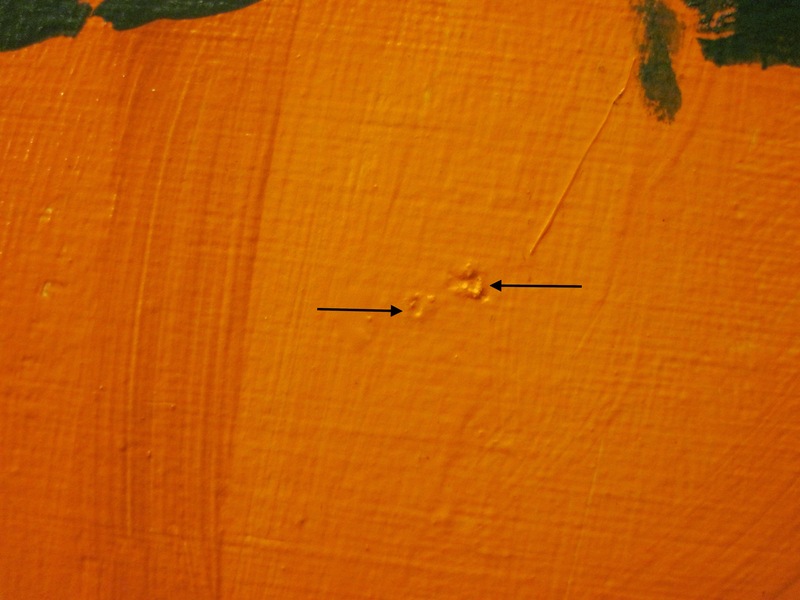 I had held the staple gun incorrectly, and instead of attaching the ribbon to the canvas, I’d shot a rogue staple right through the center of the Great Pumpkin. I wish I had a picture of the staple, but in the midst of my temper tantrum heartfelt expression of gratitude that I hadn’t shot myself in the eye/carotid artery/chest/whatever with the wild staple, it just slipped my mind. 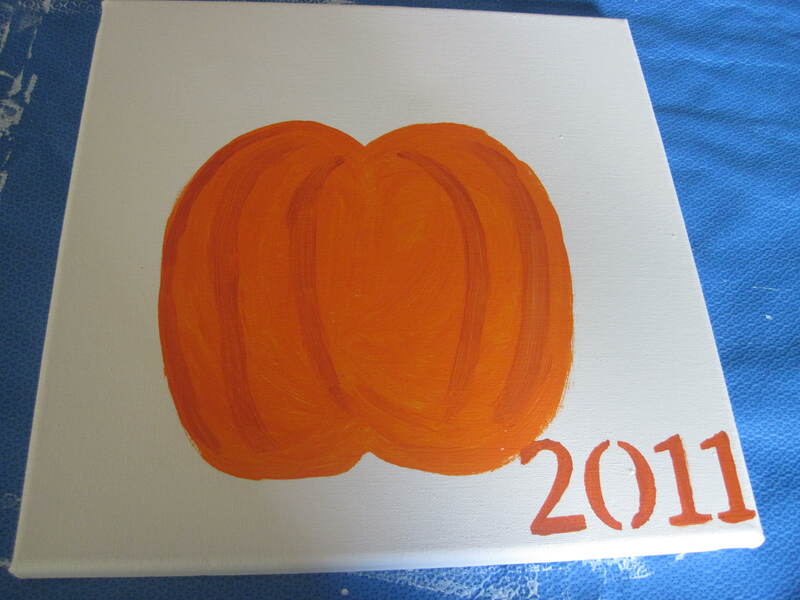 I was pretty peeved that I had damaged the canvas, but my wonderful (and always calm) husband managed to remove the staple, and blend the paint on the pumpkin, leaving only a few traces of my staple gun mishap. He also stapled the ribbon to the canvas, and presented it to me for to display. My reminder to not use tools without at least getting a brief how-to demonstration. 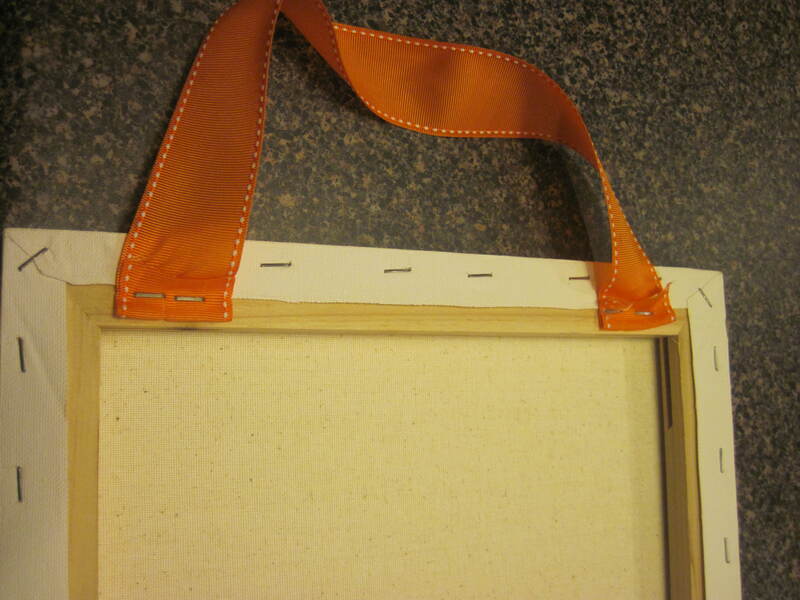 The staple gun does work to easily attach ribbon to canvas, assuming that you use it correctly. After all of that, our final result looked like this. Not too bad. And, if you harbor a better understanding of spatial relations and staple guns than yours truly, it should be relatively easy to pull this off. Obviously, if I can literally fumble through it, YOU can do it. I’ve gotten all of the mistakes out of the way for you now! So tell me. Have you ever had a creative snafu? Did something that you created not turn out exactly as you’d hoped, but you somehow managed to pull it off in the end? Have you narrowly averted a run in with a staple gun? Do tell. Please give me something to chuckle about that isn’t myself! I love fall. It’s my favorite time of year. Aside from the fact that the temperatures cool down to the point where I can come out of my air conditioned hibernation, this fall was even more exciting because I scored big on clearance fall decor at Michael’s last year , so I had some new decorations to put outside. But besides having all of the store bought tackiness outside that I can stand (scarecrows and witches and dancing ghosts and foam pumpkins, woot woot! 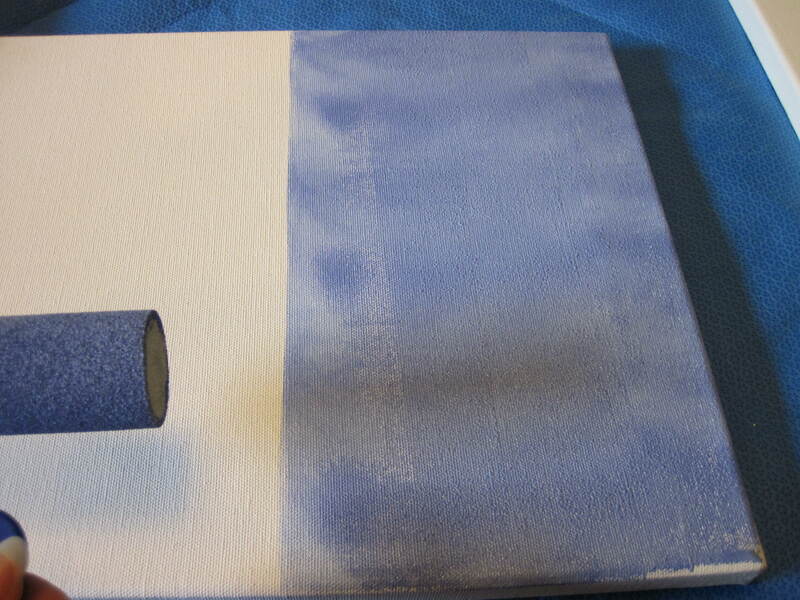 ), I found this idea (and here’s the original source ) that had me running to buy a canvas and some paint. Oooh, I did I have some perfect feet in mind for this! He looked pretty excited to be painting, didn't he? Anyway, back to the Ghost Feet Wall Art. Here’s one of the original source’s masterpieces. Pretty cute, eh? 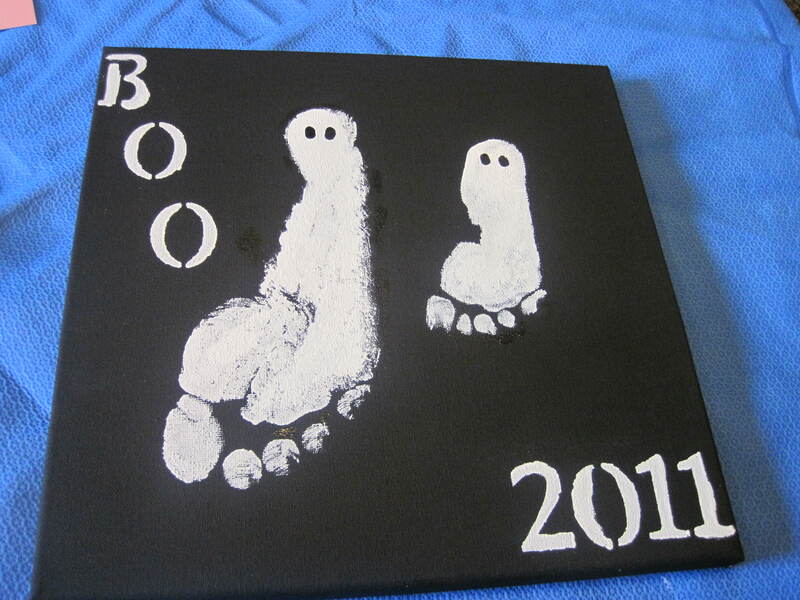 You should check out her blog, and how she put a twist on another girl ghost footprint. So creative! The original source mentioned that while you could do this on construction paper, but both she, and I, elected to use canvas rather than construction paper. I used a 40% off coupon at Hobby Lobby (Do you get their weekly emails? There’s always a coupon for something, and they only send one email a week. ), so a four pack of 12 x 12 inch canvas rang in at less than $4.79 (40% off of the regular price of $7.99). I knew I was going to use the other canvas eventually, so I went ahead and got the four pack. In fact, I had another Halloween kid created masterpiece in mind, so stay tuned for more on that later! Anyway, each canvas rang in at $1.20 pre tax, and then I hopped basically across the street to Michael’s where I then purchased two 2-ounce tubes of acrylic paint (one in black and one in white) on sale for 67 cents, and a roll of black and white polka dotted ribbon. Educators, including home educators, get an additional 15% off every day at Michael’s (bring proof that you are an educator to show at the register), so the ribbon total for those 3 items was about $5. I already had a brand new roller brush to paint the canvas, and regular brushes to apply paint to my boys’ feet, so, I didn’t need to buy more of those, making my total out of pocket cost for the project less than $7. Not bad! Then, oh happy day, when I got home and gathered my brushes, I found an unopened pack of stencils that I had snagged on clearance back in the summer for something like 50% off the sticker price of $4.99! I decided to use them rather than try to hold my usually-shaking-from -too-much-caffiene hands to the task of writing directly on the canvas. Major score for something forgotten and then found at the perfect time! Usually when I find something useful, it’s when I’m putting things AWAY from a project–doesn’t that drive you nuts?! Supplies gathered, and ready to begin! Paint, brushes, ribbon, stencil, and canvas. You may notice something is missing from this picture…something crucial to the project… FEET! Yes, that’s ok. This was a two part project. I painted the canvas black at night (two coats using the roller brush) and then gathered the feet the next day, after the canvas was good and dry. Using the roller was genius. It covered really well, and took only a few minutes time. 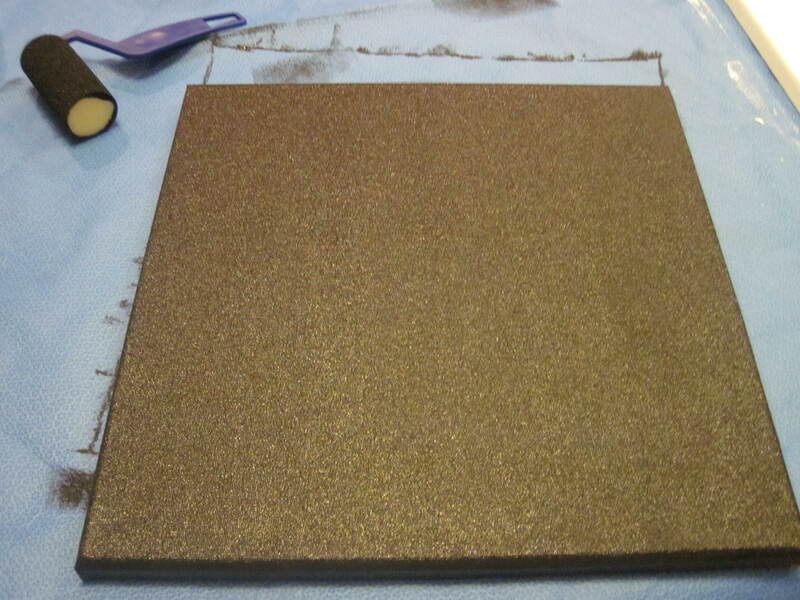 Here's the canvas after two thin, evenly applied coats. I let it dry for one full episode of Breaking Bad, so about an hour, before I applied the second coat. After I applied the second coat, the hubs and I watched another episode of Breaking Bad (we were catching up on season 4… whoa, that show is SO GOOD!!) and went to bed, leaving the canvas out to be finished in the morning. And the next morning, we got started right away, before His Majesty was dressed, and when Christopher would have been happiest to remain sleeping. 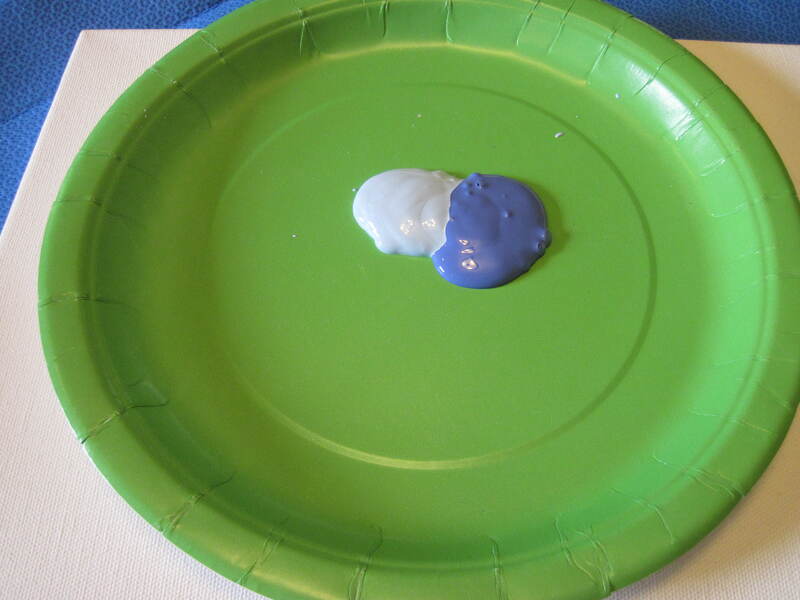 Coat the little feet evenly in white paint. 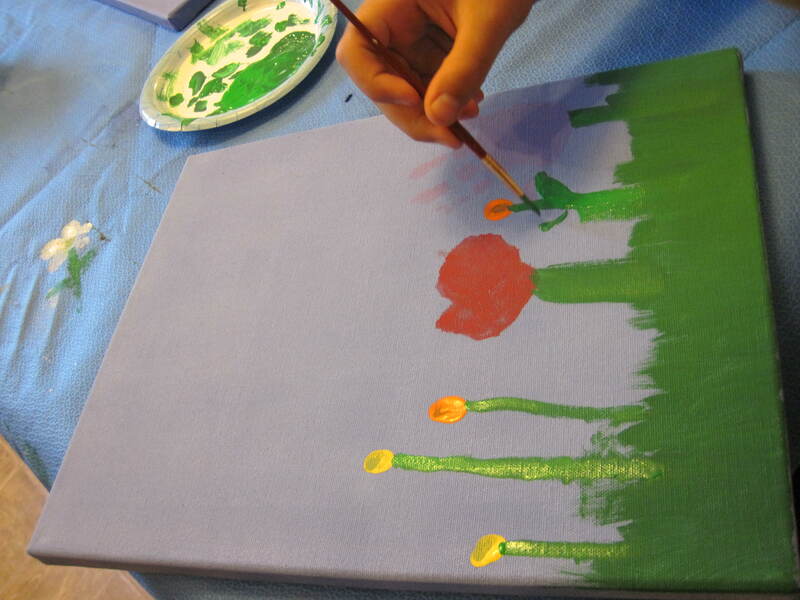 And then apply it to the canvas quickly, before it has time to start to dry. Press their feet firmly onto the canvas. 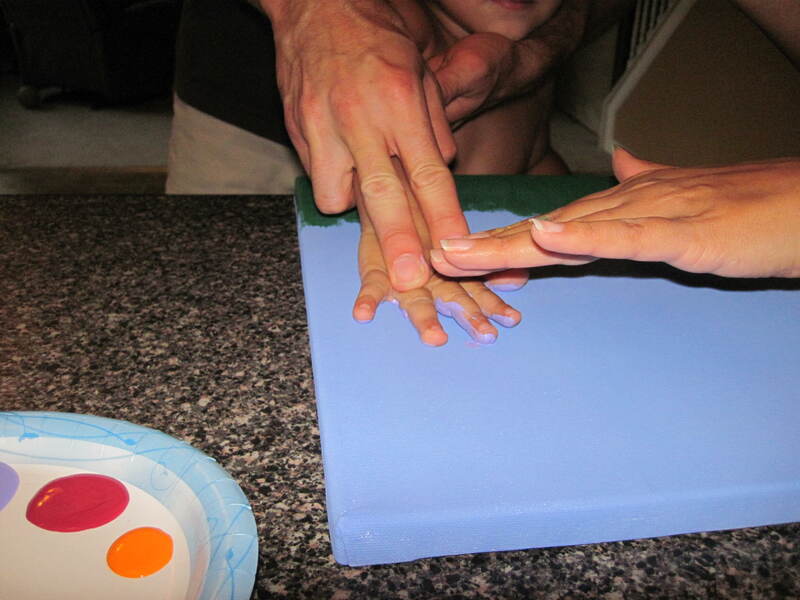 I was afraid that it would break the canvas to have them step directly onto it, particularly my oldest, who is almost as big as I am, but you could always try that method too. Basically you just want to get a good print of their little feet. We did His Majesty’s print first. He resisted, and fought back, but we bribed him with the promise of bananas, and he cooperated. Not a bad print for a first timer! 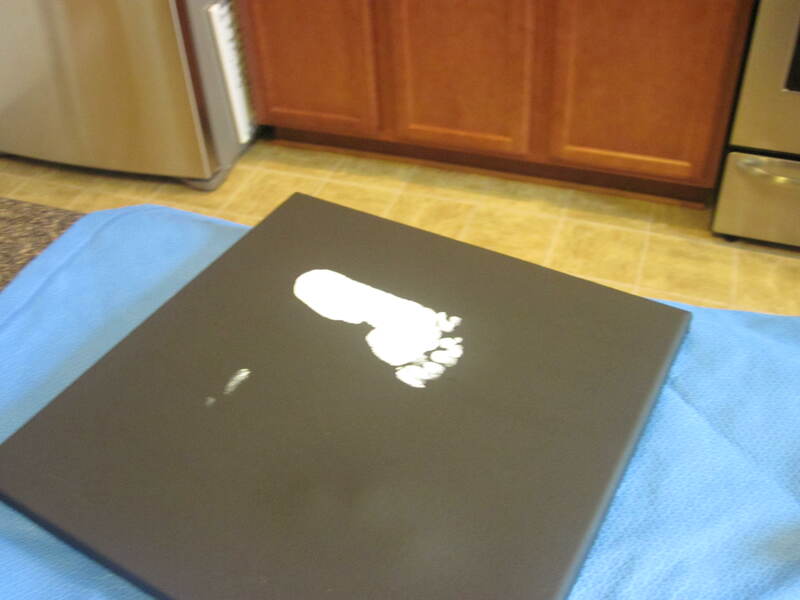 Something to note: If your print isn’t even, or if you have fuzziness where the foot didn’t make a good impression, you can easily fill it in with more white paint to fill out your footprint. Likewise, if you end up getting the look of 6 toes, like on His Majesty’s print, you can fine tune it with a bit of black paint. This is a very forgiving project. You could even paint all over it and start from scratch if you were so inclined. That’s why I didn’t worry about the white splotch that we got when we printed His Majesty’s foot– I knew it would be an easy fix. Plus, it’s kid art, so part of it’s charm (*I* think) is in the little imperfections. I added the “eyes” using a cotton swab, and used the stencils to do the lettering. I decided not to write the boys’ names, since it was obvious which print belonged to which kid. Thinking more about this, you could also glue on wiggle eyes if you wanted to be really cool. After you let everything dry again, you just have to attach your ribbon. You can also just hang the canvas as is, and forgo the ribbon, too. 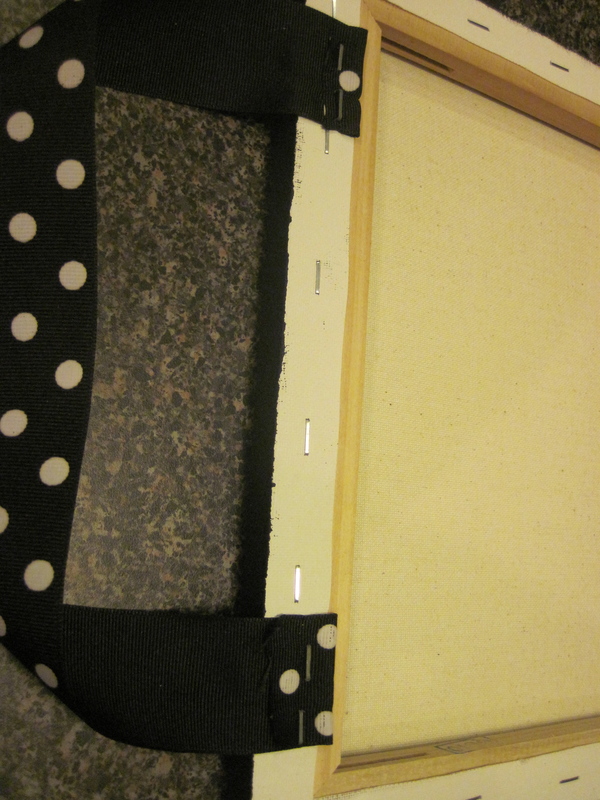 (Or you could hang the canvas with pop tabs. Have you heard of this? I tried a few months ago with some canvas that I painted for our bonus room, and it worked *like a dream*. As in perfectly. Although, getting the pop tabs off of the cans fully intact was not as easy as I thought it would be. Check out this source blog for more about the pop tab idea.) Anyway, I liked the idea of using ribbon, like the original source, so I asked my husband to attach it to the back of the canvas with a staple gun. There’s when my husband suggested that we spray it with an acrylic sealer, which would allow us to hang it outdoors without worrying that the weather would ruin it. Since we already had sealer, I figured we’d might as well, which then added a full day to the total craft time (it needed to dry for 24 hours before we messed with it again). Anyway, after the drying period passed, he went ahead and stapled on the ribbon for me. Including drying time, this wasn’t exactly a 5 minute masterpiece, but it was about as easy as it gets to create, and pretty cheap to boot. Plus cute. And festive. Don’t you think? This is something that will surely bring a smile to my face from year to year. Have you created anything beautiful lately?